Jack Richeson Signature Brushes are my favorite go-to brushes for good reasons. They are extremely well made, supple, yet durable. Richeson brushes have been my workhorse tools for over thirty years because they do what I ask and never fail. Buy them and try them. You'll be glad you did. Set includes: Quality Interlocked Hog Bristle Flat Sizes 2, 4, 6 and 8; Filbert Sizes 2, 4, 6 (or 5), 8 and 12; Brights Sizes 10, 12 and 16; Pure Kolinsky Sable Rounds Sizes 8, 10 and 12. 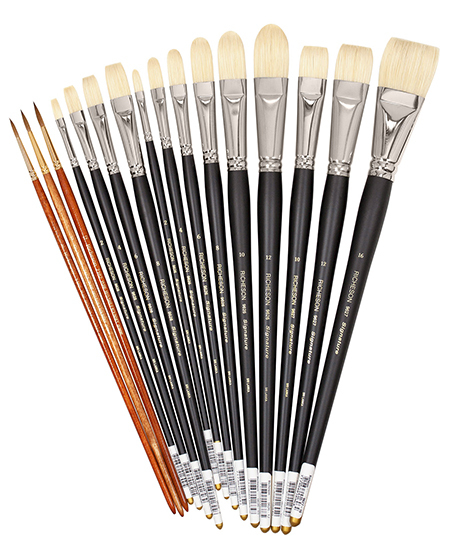 Click the button below to add the John Hulsey Studio Oil Brush Set by Richeson to your wish list.